The Kapiti Lights upgrade is a key project in the Council’s town centres transformation programme which aims to take advantage of the opportunities provided by the Kapiti Expressway. “Our goal is to see the Paraparaumu town centre become the vibrant heart of the district and the improvements we’re making will make the area more pedestrian friendly which in turn will help create a setting that supports new and existing businesses to thrive. Chairperson of Kapiti Lights Body Corporate, Iride McCloy, says the upgrade for Kapiti Lights has been many years in the making and it’s great to finally see the work getting underway. “The upgrade will make the area a much more attractive proposition for people wanting to access businesses and services in the area and, in time, it’s anticipated businesses will enjoy an uplift in passing trade,” says Ms McCloy. The Thomas’s from the Kapiti Cakes Bakery welcome the move to make the area more pedestrian friendly. 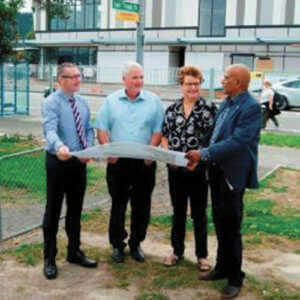 “Providing better connections from the transport hub through the Kapiti Lights area, Coastlands and out onto Rimu Road will certainly improve foot traffic which is good for business,” Mr Thomas said.